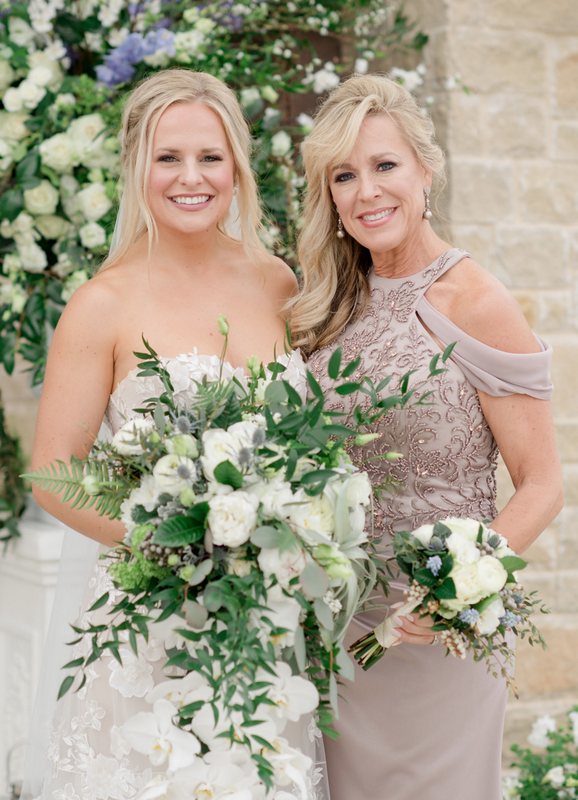 “While attending Texas Christian University, Lexie had an internship with an event planner and had no idea that it would eventually lead to meeting her future husband. She had created a bond with one client and during her client’s annual Christmas party she met the client’s son who was a recent TCU grad. They were both in relationships at the time but a year later they met again at the Christmas party and Cole spend most of his evening staying by Lexie’s side. He invited her to join his friends at Top Golf and they shared their first kiss later that night. Lexie and Cole’s wedding will always hold a special place for me. I met Lexie interning for the same event planner in which she had interned before me- through which she met her husband. Lexie and Cole hired me to plan their entire wedding weekend- rehearsal dinner, wedding, and sunday brunch for all their friends and family! Because Lexie and Cole both live in Miami, I actually got to plan the whole wedding with their families, leaving most of it a surprise for the bride and groom. Lexie and Cole trusted me with their wedding vision and most of the design decisions so that they could experience everything for the first time on the day of their wedding. The only thing design direction Lexie gave was that she loved the color blue, and wanted that to play a main role in her color palette. 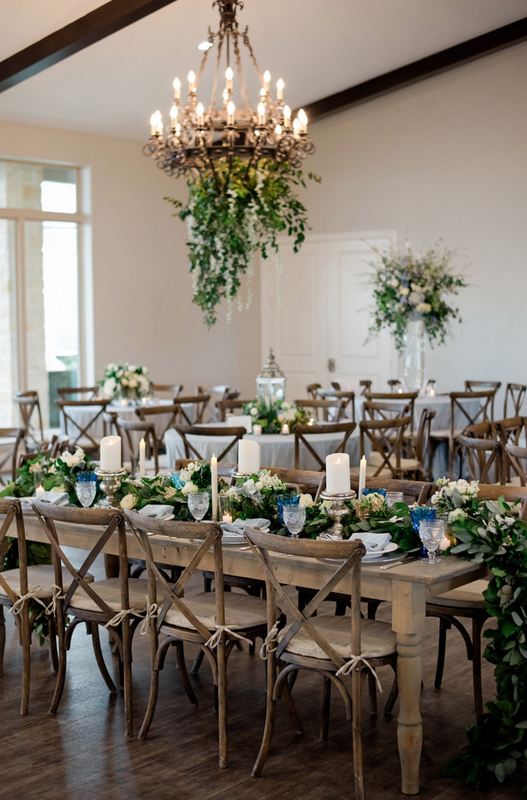 We transformed the venue, Dove Ridge Vineyard, into a lush tranquil garden filled with velvet blue linens and green and white flowers covering every inch of the ballroom. We brought in wood cross back chairs for all the guest tables to change the aesthetic of the space to a more rustic and farmhouse feel. Accents of white were brought in through the custom dance floor, stage facade, and lounge furniture which sat on either side of the dance floor and in front of the inviting stone accent fireplace. The head tables were custom farmwood tables from Perch Event Decor and were decorated with silver dinnerware, vintage glasses, and striking blue agate place cards for each of the wedding party members. A lush greenery garland ran down each of the head tables, along with an assortment of candles to mirror the guest table arrangements. Just outside the ballroom was a custom clear top tent for guests to sit amongst the lounge furniture and enjoy the stunning views from this mountain top vineyard. 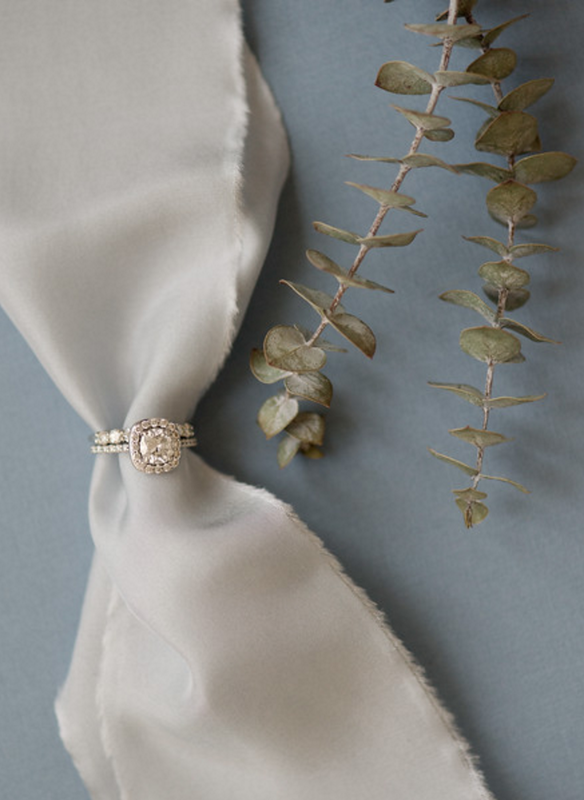 Lexie and Cole’s custom monogram was displayed throughout their wedding, sitting at the entrance of the venue, behind the outdoor bar, and even on the dancefloor. 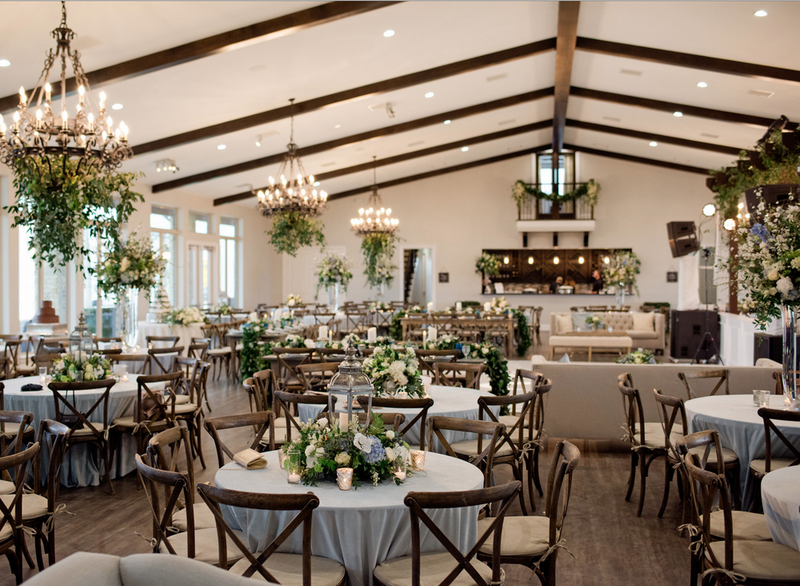 Finally on their wedding day, Lexie and Cole were able to walk through the venue and see the final stunning transformation of this North Texas vineyard. Lexie and her bridesmaids were the first to arrive at the venue the day of her wedding. 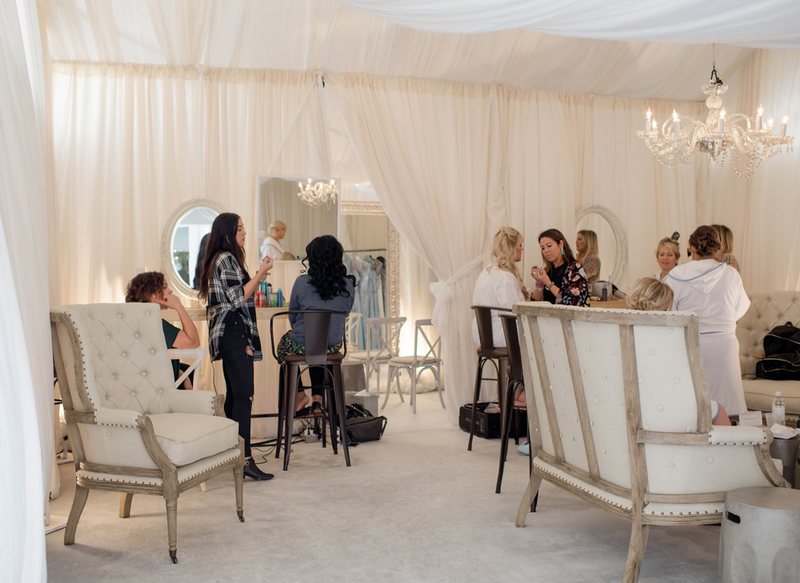 We built a custom bridal suite tent for her and her bridesmaids to get ready in their custom monogrammed robes and slippers. The boys were the next to come and got ready in the venue’s private suite upstairs. Just before the ceremony was set to start, we were met with a classic Texas rain storm. Guests were greeted with umbrellas and a string quartet played while they found their seats amongst the rows of white cross back chairs. The moment Cole saw his bride walk down the aisle, the rain ceased and the sun peaked through (that’s some real wedding magic!). After the ceremony, guests were invited into the ballroom for cocktail hour, meanwhile the ceremony space was being transformed. While guests enjoyed cocktails and appetizers inside, we removed all the ceremony chairs and installed a custom bar, lounge areas, and a full donut and candy store for guests to enjoy during the reception. Lexie and Cole made their grand entrance into the ballroom amongst all their loved ones and went into their first dance, Perfect by Ed Sheeran, performed by the Empire6 Band. The rest of the evening, guests enjoyed a real Texas meal from Bonnell’s catering and a 5 tier ‘naked’ cake adorned with figs and berries. 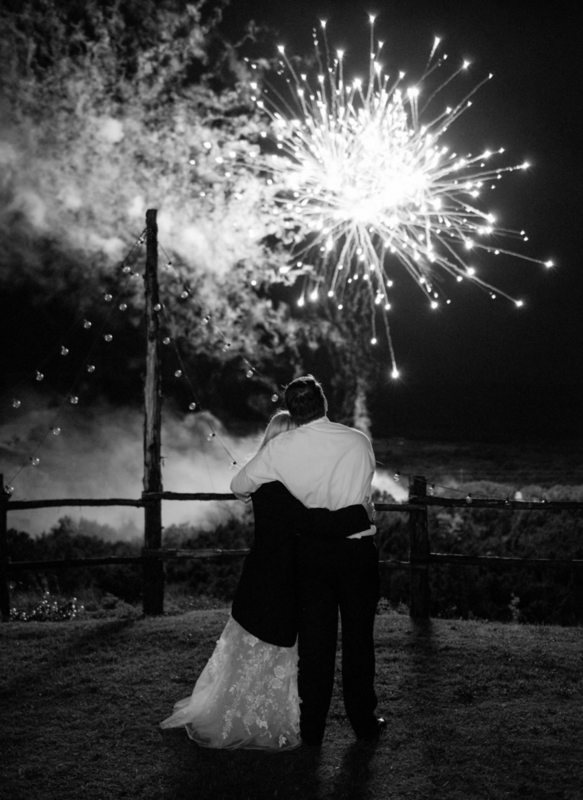 Just as the night was supposed to be winding down, guests were invited out to the tent for a surprise firework show. Once they returned in the ballroom, it was party time! Guests spent the rest of the dancing on the custom dance floor and enjoying donuts and snacks form the donut store outside. 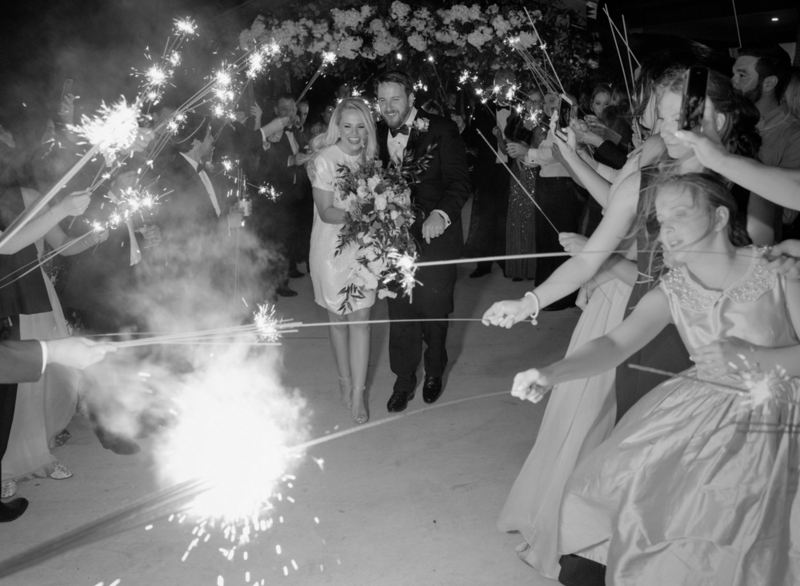 As it was time for the bride and groom to leave, Lexie changed in to her getaway dress as guests lined up outside with sparklers. 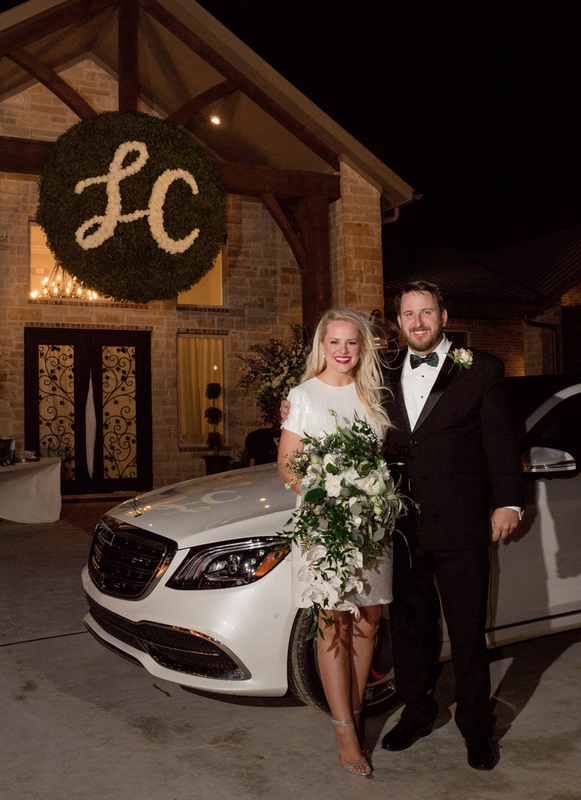 Lexie and Cole made their getaway in a brand new Maybach and drove away as sparkler fountains lining the driveway shot up into the air- a spectacular night with a spectacular ending!